The magic that is Bone Broth, I could almost write a whole blog post on bone broth. If you haven’t given it a try yet, I suggest you do ASAP. There’s a reason we like to have chicken soup when we are sick, our bodies know that the bone broth in the soup is where the healings at. 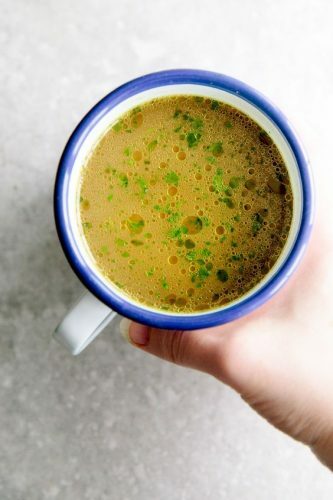 Bone broth has been used for centuries to heal cold and flus, and more recently issues in the gut as all of the nutrients are easily absorbed by the body. So what is it? Bone broth or stock is made up of every part of the animal including, bones and marrow, skin and feet, tendons and ligaments that are boiled and then simmered over a period of hours (usually 24). The simmering allows the bones and ligaments to release healing compounds like collagen, proline, glycine and glutamine that have the power to boost your own natural collagen, speed up your natural healing, reduce cellulite (what?! SOLD!!) plus so many other benefits. You wont be just improving your glowing skin, you will be healing many areas of your gorgeous body! I suggest when buying your whole carcass for the bone broth, that you ensure it is free-range and organic. Keep up to date with all things wholesome, Wellness tips and incredibly easy, nutritious Recipes!! PLUS Exclusive VIP Offers! In a large Soup Pot, on med heat, add Cerlery, Garlic Oil for 2 mins. Add all remaining ingredients, cover with water. Reduce heat to a low heat and allow to simmer for 24hours. Strain and remove all solids. Store in fridge, consume within a week or freezer and can be stored for 3 months. Great idea to freeze in cupcake moulds (as pictured below) to grab and heat individually. You can consume as a hot beverage or add to your soups, risottos etc. HEALING BONE BROTH to make Chicken Zoodle Soup!